I’m very interested in your perfume journey, particularly what it was like for you when you first started. 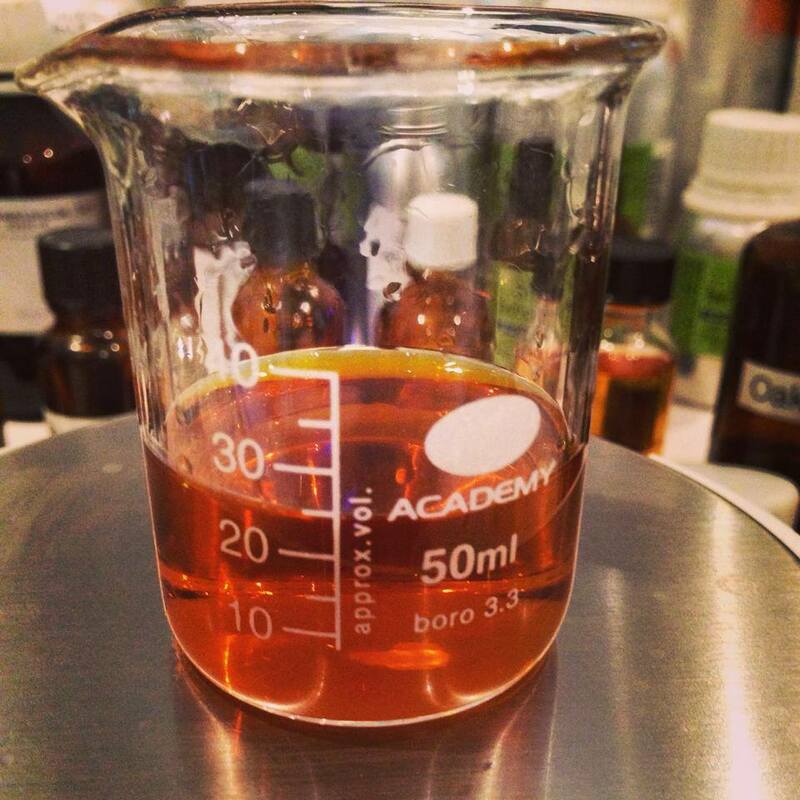 How did you teach yourself the basics of perfume creation? Did you just jump into the deep end by experimenting with different essences? 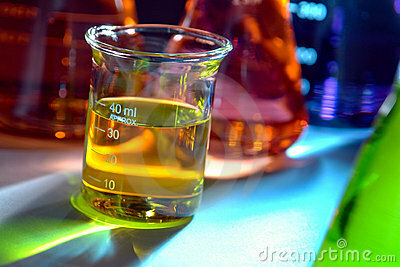 If so, do you remember the very first things that you put together in a beaker, and what the end result was like? Before my perfume journey began, I had my own practice where I performed remedial massage for individuals, and I would often incorporate essential oils into custom blends. I had a very basic olfactory understanding of the more common oils and absolutes used in this field. Occasionally, I would create a blend for a client that was quite beautiful and often think to myself that it could make a lovely perfume. Back in 2007, I attempted to blend some basic essential oils with vodka — and the results were disastrous. These were oils that I had in my treatment room that I had used in massage blends for my children and clients; oils that I would drop into my bath and some of these oils I would use on my horses for keeping flies away or muscular injuries. There was no real consideration for the finished blend; I simply thought I’d give perfume making a go and utilized the materials I already had. Looking through my very early notebooks, I still have a record of this blend: vetiver 10 drops, sweet orange 6 drops, jasmine 12 drops, bergamot 5 drops, oakmoss 4 drops, all mixed with some vodka I had in the cupboard. It was a complete disaster! The oils separated in the mix, the smell was awful, and the end result wasn’t even passable as an eau de cologne. Jumping in at the deep end really wasn’t going to work and I realised early on that, if I was to stand any chance at creating a remotely wearable perfume, I needed to study and understand each material in isolation before I could even attempt to blend the materials together. There were also so many materials that I’d never smelt before and this fired an obsessive need to smell everything. I spent the next two years gradually building up an extensive collection of naturals that I could use as study material. I bought every book I could find on the subject of perfume making and the materials involved. I began writing my observations on each individual oil or absolute, fanatically marking down odour profile, tenacity, similarities to other materials and how each one made me feel, which material had a particular synergy with another and whether it functioned as a top, middle or base note. I separated my notebooks into categories of flowers, resins, bark, roots and leaves, and I began to understand much more than the basic individual characteristics of each material. Over time, I started to see the olfactory correlation with the part of the material that was used. I smelt the same material that had been subjected to different extraction methods and noted the changes in the odour profile. I bought jasmine absolutes from France, Egypt and India so I was able to identify the differences and possible applications for each. My children would ‘test’ me on this and dip smelling strips, blindfold me and ask me to say which material I was smelling and from which country. My own (fairly vast!) 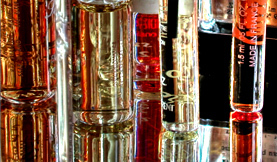 perfume collection became a separate source of study as well. I would attempt to detect individual notes within these perfumes, a process I found hugely frustrating as, at this stage, I had never smelt an aroma chemical in isolation and knew absolutely nothing about them. At this point in time, I had nothing that I was really working towards; I was merely satisfying a curiosity and obsession that had me in its grip. I knew that I WOULD create a wearable perfume for myself but there was no time limit for me to learn and it was this freedom that really enabled me to enjoy the process without rushing. In 2009, I enrolled on the CFSS course that is run by the Fragrance Foundation in the UK. This distance learning course allowed me to fully understand fragrance genres and gain a wider understanding of the perfume industry in general. The exam was online, and I remember vividly that my children were at home on this particular day so the exam was taken amongst complete and utter bedlam, but I did manage to pass with a fairly respectable grade! By this point, my obsession with perfume had reached a stage where I was desperate to study in a more professional capacity, but I found the doors to the most creditable perfume schools well and truly closed. It was a frustrating time, as I had my heart and head completely set on becoming a perfumer and become unsure that I could move forward and achieve this goal. In 2010, I found a course that was run by the late Alec Lawless. 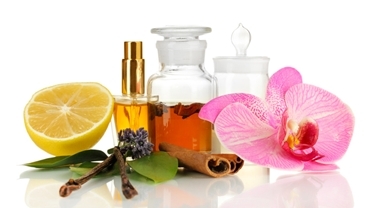 This 5 day course covered perfume making using naturals. It was on this course that I met my very dear friend Karen Gilbert, and we instantly clicked. 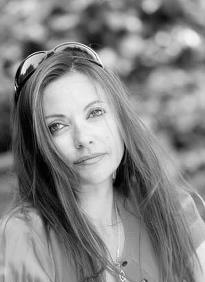 Karen was previously an evaluator for IFF and she has a great understanding of the industry. The course run by Alec was fantastic, but I remember feeling a little deflated that the perfume I created in the 5 days didn’t really smell like a ‘proper’ perfume to me; it was a really nice blend but it was missing something. When I returned home from the course I regularly kept in touch with Karen and, when I expressed my disappointment in not being able to create a ‘proper’ perfume, it was Karen who suggested I use some aroma chemicals to see if this could improve things. I started buying small amounts of materials from Perfumers Apprentice in the US, and spent months and months evaluating as many as I could. These were far easier to understand than the naturals, and I began to hope beyond hope that I had ‘cracked the code’ and that this newfound understanding may be key in tightening my hold on the building blocks of perfume construction. Immediately, all of the perfumes in my personal collection began to make sense. I was able to suddenly detect these aroma chemicals swirling around with naturals, and I was so excited that these could be the key that would unlock the perfume I had in my head: the perfume I had been trying to create but failing. From this point on, I really didn’t look back, and I started sketching out on paper a perfume that would be for me, a perfume that included all the facets in a perfume that I love. This perfume became Anubis. What were some of the early challenges that you faced when teaching yourself about the science of perfume creation as a whole, and what were some of the unexpectedly easy parts? For example, was it hard to learn about precise proportions, or any of the more chemistry-related aspects? There were so many challenges in the early days, and there still are. I was thrown out of chemistry class at school for chatting with my friends too much, so my understanding of chemistry was and still is pretty nonexistent. I can understand the materials that interact badly with each, but I don’t know the chemistry behind why this happens. I have bought myself books on the chemistry of fragrance, and I still don’t understand what I’m reading. It might as well be printed in a foreign language. I really do have a complete blind spot where chemistry is concerned, although I’ve tried really hard to overcome this and had even considered taking a degree in the subject but I would have been truly out of my depth. I have now accepted that it’s a subject that I really struggle with. So I try to fill the gaps in my chemistry knowledge with a creative understanding of the materials that I am working with. Photo: Tony Cenicola for The NY Times. Across a lot of my interviews I’m asked about the process of making the perfumes, and I always draw a comparison with another of my great passions: cooking. When I bake, for example, I may not understand the scientific reactions occurring within the mixture; I have no detailed analysis for why we add X amount of one ingredient and Y of the other, or why these “raw materials” must be placed at an exact temperature. Despite this, through books, trial and error, and the use of my senses, I can still make a damn good cake! While I have the greatest respect for and deep interest in the chemistry behind perfume, it is so broad a topic, so intense and so detailed that, to me, it is an entirely different discipline altogether and one which would require another ten, perhaps even twenty years of study. Therefore, I inevitably perceive my process to be one dictated by artistry, rather than science. Creating perfume, like preparing a delicious feast, requires time, patience and a level of technical understanding; there are materials that will always be harmonious in a blend, and the ones that can be thrown in as a wild card and create something utterly unique or bizarre. I’m absolutely convinced that the more experienced one is at creating a perfume, the quicker the process, but there are certain aspects that cannot be rushed, particularly if there are a lot of naturals within a formula. Naturals by their very nature are complex and demanding materials, they’re difficult to tame, and they don’t always react the way you think they will. When a formula combines lots and lots of naturals layered over each other, the results can be unexpectedly beautiful or like mud. Handling these materials is for me the biggest challenge, as they are so liable to change throughout the maceration process. Naturals are the soul of a perfume but they always, always require time to show their full potential and sometimes this potential is never reached. Instead, all you are left with is a sludge of smell that doesn’t function as a perfume. 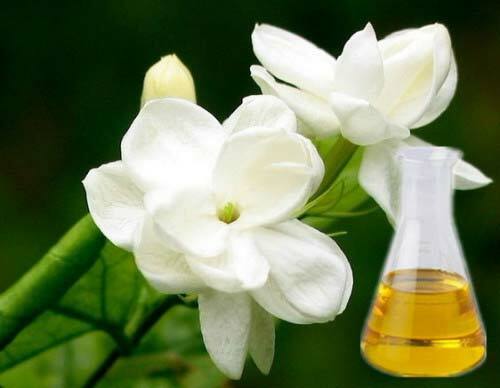 If you would like to cheat a little, then it’s comparatively easy to produce an average perfume by using a lot of aroma chemicals and wafting a little rose oil near the beaker but for me, this is not challenging enough and doesn’t produce a beautifully multifaceted perfume. I am certainly not anti-aroma chemicals, as it was these materials that enabled me to build a properly finished perfume, but the way I work is: 50% naturals, 50% synthetics. Rose Maroc Absolute being weighed for Tobacco Rose. Source: Papillon Perfumery. I don’t consciously think about this while I’m creating a perfume; it just happens because I have found a balance that I feel works. When Simon went over the finished formulas for the three perfumes, he found the ratio of naturals to synthetics with Anubis to be exactly 50/50, with Tobacco Rose it was 46/54, and with Angelique 48/52. He asked me if I had actually worked this out beforehand, and was surprised when I hadn’t. My maths skills are almost as bad as my understanding of chemistry, but I think I’ve reached a stage where I can smell if a perfume is balanced the way I intended it to be. Anubis could have been a far bigger perfume if I’d loaded it with aroma chemicals, and I created an early mod doing exactly this. All of the beautiful facets from the naturals had been obliterated by the synthetics and the formula was firing around with no connection whatsoever inside an exploding toxic bomb. A quieter silage was the trade-off with Anubis, as in the end I went with my heart and the true vision I had for this perfume. Tiare Absolute for the upcoming White Moth. Source: Liz Moores & Papillon. The new perfume, White Moth, is no different. The tiare absolute for this perfume is so delicate, almost fragile, that if you try to underpin the formula with musks, they dominate and obscure the tiare; adding a synthetic white floral to amplify things unfortunately takes everything down the path of a functional product. The naturals here have to keep everything in check. It’s a balancing act all the time, trying to get the essence and heart of the finished perfume to come forward and take center stage, while still allowing the supporting cast their moment in the spotlight too. The modification process is one of the hardest and lengthiest for me. I find it hard to know when to let go of a perfume, to put it out there and announce that it’s finished. There have been many times in the studio when I’ve announced that a perfume is finished and Simon never believes me. He knows there will be countless more modifications and procrastinations from myself until I’m thoroughly satisfied that I can do no more. I find the creative side of envisioning a perfume relatively easy and it is certainly the part that excites me. It gets harder when faced with expressing these ideas using smell instead of words, as there has to be the resolve to keep the perfume on track at all times; without this focus the formula may morph into a totally different beast. 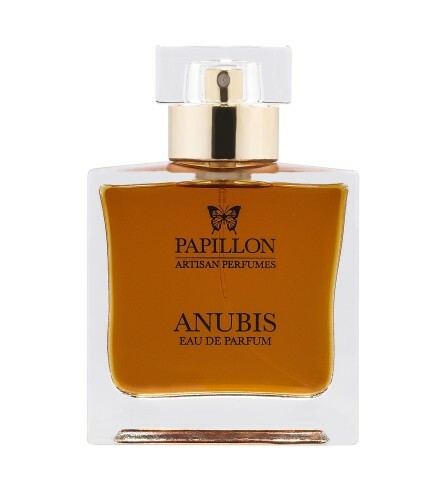 With Anubis, for example, I stubbornly refused to let go of my vision for that perfume but there were times when the early mods skewed slightly and I found myself with perfumes that were really good but not Anubis. The temptation after two years of fiddling with mods to just pull out a ‘good’ mod and roll with it was strong, especially when I was feeling completely exhausted by the process. Maybe it’s my inherently stubborn streak that propelled me forward and kept me going, maybe it’s because I’m my harshest critic, I don’t know, but I didn’t allow myself to stop until I felt the perfume that had manifested itself was an accurate construction of my earliest desires for what Anubis would be. 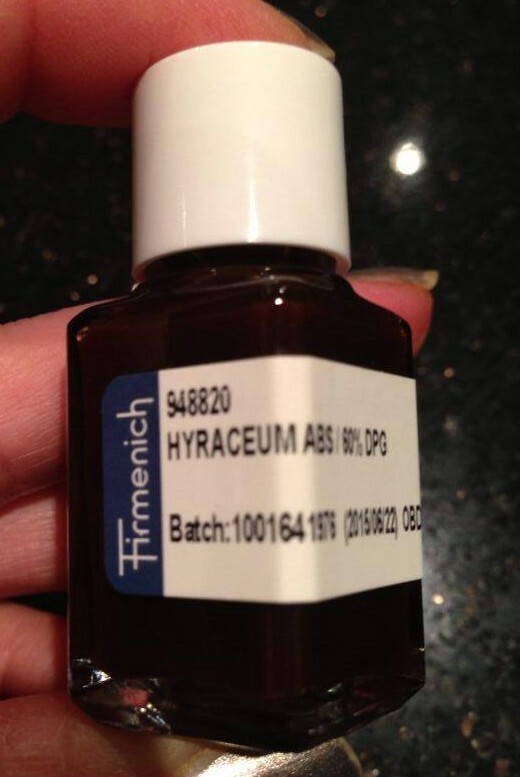 I’ll use Anubis as an example of one of my earliest challenges, as this was the first perfume I made. I created a very basic sketch on paper of how I imagined the perfume would smell and the materials I wanted to include, feelings I wanted to conjure within the formula. At this stage, I only use naturals in my preliminary sketches, as I find these the hardest materials to evaluate within a blend. Evaluating them with aroma chemicals complicates things further, as I find it harder to pick apart any flaws that could be standing out. Top notes: Lime, bergamot, bitter orange, neroli, black pepper. Middle notes: Pink lotus, geranium bourbon, rose otto, jasmine, saffron, orange blossom. Base notes: Opoponax, frankincense, myrrh, labdanum, sandalwood, vanilla. Liz Moores’ old perfume formula notebooks. Source: Papillon. These materials I blend into separate beakers at the proportions that I feel would work in a finished formula. I will briefly evaluated the top, middle and base notes separately, and write my thoughts in my notebook. I don’t do anything on the laptop, as I prefer the more organic way a notebook feels and it’s a lot easier to take out and about with me too! Then it’s back to allowing these materials to hopefully work their magic, a process that in terms of time has occasionally taken up to 10 weeks. I will be continually evaluating these sketches and making notes, creating more sketches built around the original materials in varying proportions, sometimes adding, sometimes subtracting a material, often placing another natural in a new sketch just to see what happens. One of the Anubis compounds. Photo: Liz Moores and Papillon. After that, I will start creating accords to use within the formula. So, for Anubis, I created an accord of oakmoss, pink lotus and a touch of patchouli to place in the middle note section to see how it changed things, how it would interact with the florals. Anubis contains the original, natural ‘leather accord’ that I created back in 2010, a smell based around my horse’s saddle, but everything else in the formula was adjusted and balanced. There would also be more accords woven into the base notes, and so on and so forth. 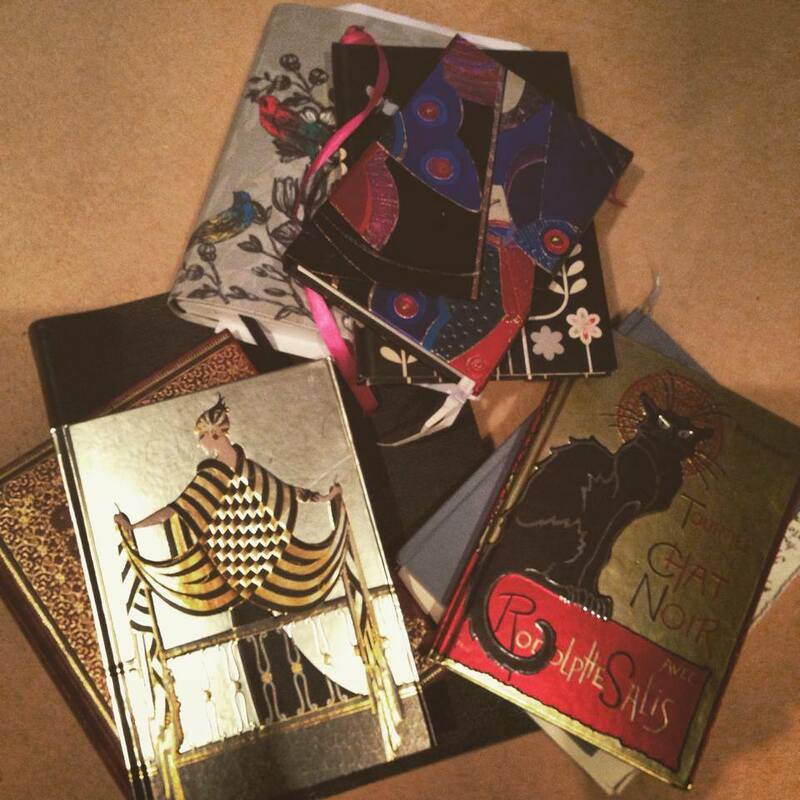 The process is constant analytical tweaking and habitual note-taking until I can find the heart of a perfume. 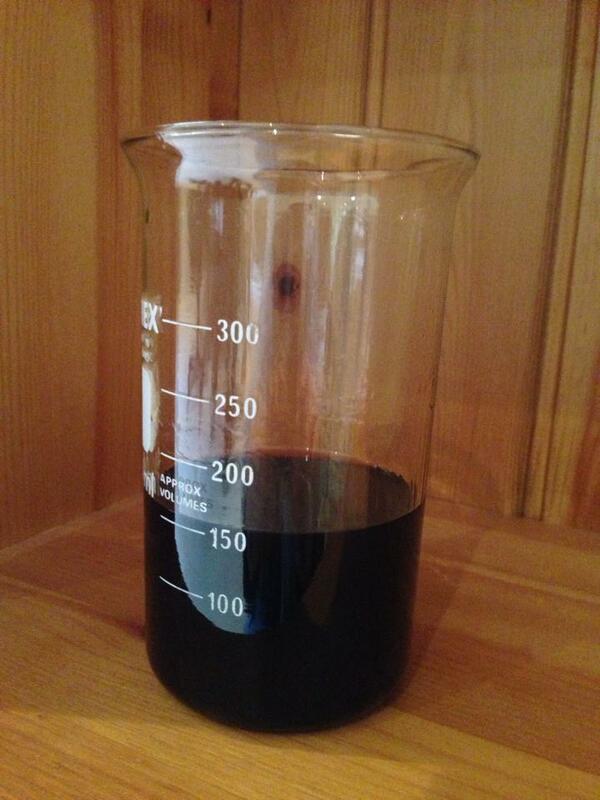 I will then blend the top, middle and base notes at varying ratios, for example 20% top, 40% middle, 40% base. After that, I wear the natural blend on my skin for a few weeks to see how the materials are performing (I don’t add any alcohol at this stage), and friends and family are dragged into the studio so I can smear them with the natural sketches. Throughout this process, I am constantly filling notebooks with how the materials are interacting, my thoughts and ideas to take the formula forward. Then I move things on to the stage where I’ll start adding the synthetics, and this is the process I find the hardest; balancing all of the naturals, retaining the essence of them, and trying not to obscure everything with a hard synthetic fist. This process is the same for the naturals, adding, taking away, leaving things to settle, and going back to the drawing board until I’m completely happy. I then make up full size 50ml bottles of the final complete mods and these are left for 6 weeks until I start to wear them, spray them on others and observe how the perfume is developing. There have been times when I’ve reached this stage only to find that a material might be jarring with another, and so the entire process starts again. This method has now become the standard for every perfume I have created since. In terms of the most challenging fragrance that I’ve made, I’ve been working on a new perfume for the last two years and this particular perfume has been through more modifications than any other perfume I have created. In early January, I had to re-work the formula due to compliance issues, and on first smelling it wasn’t great. This isn’t unusual at all as perfume needs time, so I placed the mod away and decided to give it a week before I sniffed it again. A week later, the formula had twisted completely and was even worse than before, so I decided that this was probably one perfume that would never see the light of day. At that moment, it was so bad and needed much more work. At the end of January, I thought I would have one last sniff (I couldn’t resist), but I told myself that I must forget this mod as it was driving me insane. I liberally sprayed myself, then had to double-check the bottle, because I was convinced that I’d sprayed myself with something completely different. This mod from early January had, within a few weeks, transformed itself into a perfume of entirely different proportions! Where it was thin and slightly screechy a few weeks ago, it was now fat and luscious with huge depth and longevity. Time achieved this, and I’ve noticed with this particular mod that it just keeps getting better and better. I’m now at the fascinating stage of waiting for this perfume to stop transforming. I haven’t a clue when this will happen but I’ll know when it does. I’d like to focus on specific materials. What notes did you initially find to be challenging to work with, either due to their innate properties and characteristics, or something else? Which ones were easy from the start? I’ve always found the darker, more resinous materials like labdanum, oakmoss, patchouli and tolu very easy to incorporate into a blend. They have a natural smoothness and affinity with the majority of the florals, and I really enjoy working with these. They also possess an innate natural stability (with the slight exception of oakmoss), so the results when using these materials are relatively predictable. Animalic notes I absolutely adore, and I find them a joy to work with. Castoreum and hyraceum are my two of my favourite animal notes, and the effects they can create within a formula can be breathtaking. These require a lot more patience within a formula as they need such a long time to work their magic but their ability to withhold their true potential until months later fascinates me. The naturals can be challenging, but I find aroma chemical musks the hardest to work with. 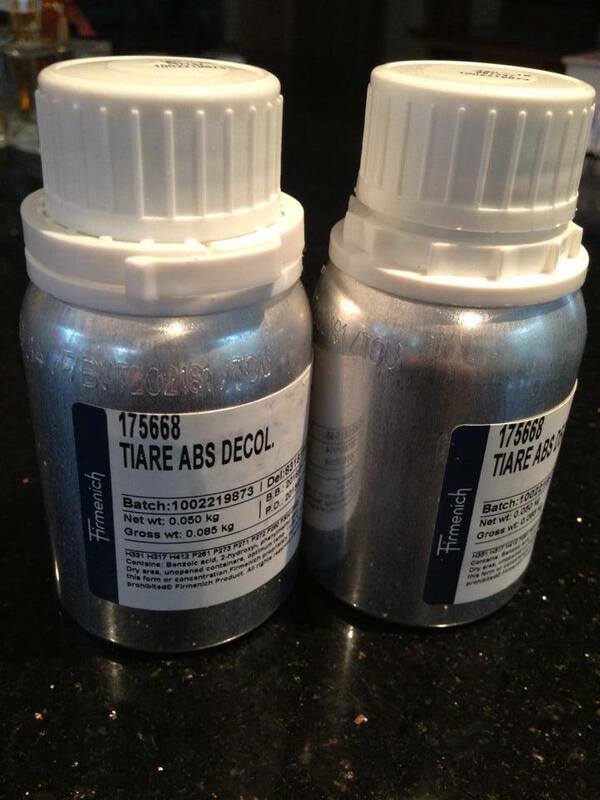 As a result, I tend to use them rarely and then in very low amounts. I’m anosmic to the majority of them until I add them to a formula, and then they have the disadvantage of often dominating a blend. I used some Ambrettolide a long time ago in an early mod that never saw the light of day. When I standardised this material I could barely smell it but, when I returned to the mod a few weeks later, it had completely overwhelmed the formula. All I could smell was fabric conditioner. Reducing the amount didn’t seem to help things very much at all either, this material was still sitting in the forefront of the formula crashing all over the other materials. I think there are certain musks that can be very helpful in a perfume and if balanced correctly can enhance the rest of a formula. Musk R1 is a musk that I like very much. It has some nice, soft animalic notes with a backdrop of spice and I used this material in Tobacco Rose. Are there any materials that consistently remain a bit tricky, perhaps due to how they interact with other elements? Are there any notes that you find a little intimidating? For example, Josh Lobb of Slumberhouse has said he always avoided making any florals for his line, and that he disliked roses, but he recently challenged himself to work with them for his latest scent, Sådanne. Are there any notes that are like that for you? 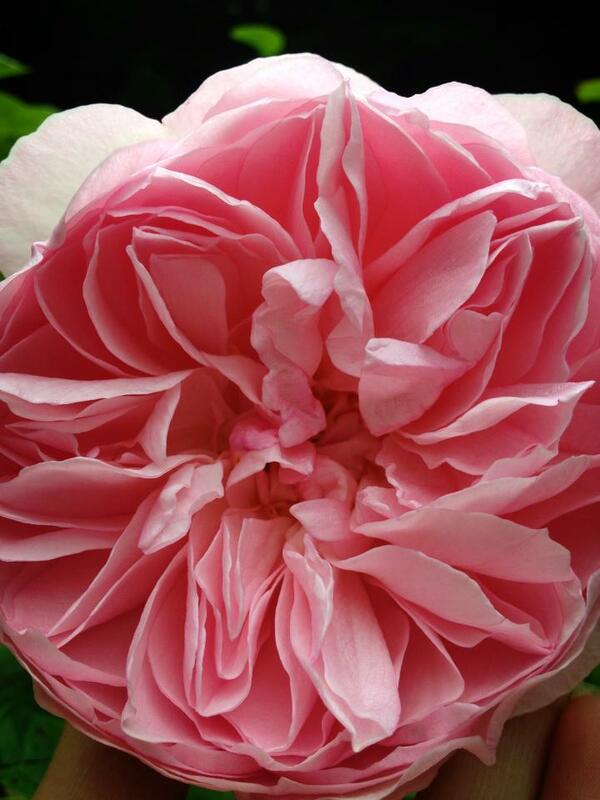 One of the roses in Liz Moores’ garden. Source: Photo: Liz Moores & Papillon Perfumery. Straight-up florals I find very hard, because getting close to the scent of a real flower is such a technical challenge and I am in awe of the perfumers who can produce a realistic floral. Fracas always comes to mind when I think of a real tuberose magnified a billion times; the skill in that perfume is incredible and, in my opinion, one of the very best in its genre. Tobacco Rose took me to the edge and back because I find rose one of the hardest natural materials to manipulate into a formula where the rose has the starring role. As an accessory note, it’s quite easy to work with; it can be buried amongst green foliage, twisted among bark and leaves but to stand alone they really are difficult. Again, this is an easy task if one takes the road of the synthetic, but every synthetic rose reconstruction I’ve tried smells like cheap hand soap and harshly synthetic. Tobacco Rose became my nemesis at times and there was a point at which I packed all of my materials away and swore never to attempt another perfume. This perfume battered my confidence and challenged me like no other but I did go back to this perfume because I refused to let it defeat me. It became an exercise in self-control and greater understanding of how natural rose materials behave. I discovered that rose absolutes and oils argue within a formula, or hide away and sulk. They need a steady manipulation and gentle introduction with the rest of the materials they will be sitting amongst. The task I set myself was to create a rose by only using the real thing whilst still complying with IFRA and EU regulations. I managed to get around this and use a very large amount of natural rose by blending two different types of rose together. The Bulgarian rose otto I use is quite high in natural eugenol, an allergen that IFRA really don’t like at all, so I blended this with lots and lots of Rose de Mai that has no eugenol present in its chemical make-up. It contains other allergens, but not the dreaded eugenol. I added Geranium Bourbon to extend the rose note and some other materials to create the rose heart. Another rose in Liz Moores’ garden. Photo: Liz Moores. 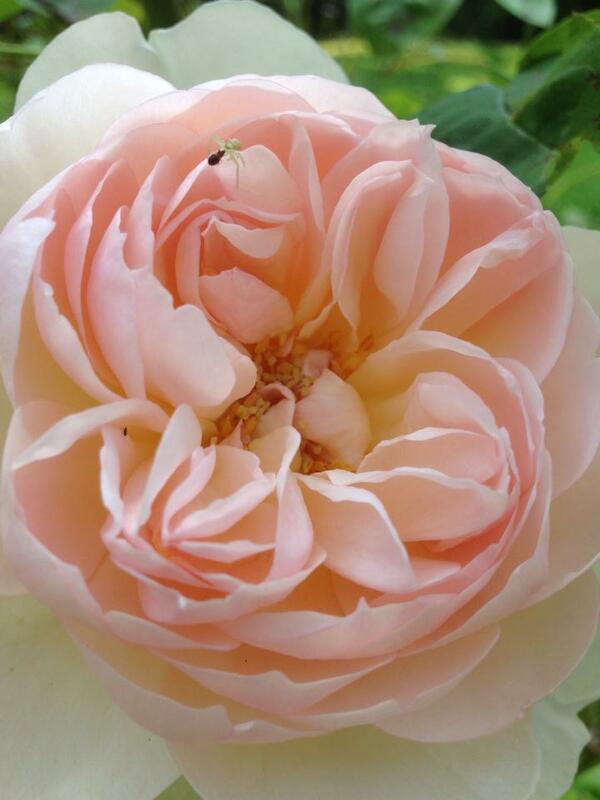 Rose is also difficult because the absolutes in isolation don’t smell like the living bloom at all, so it was all of the accessory notes around the absolutes that brought the finished perfume as close to a living rose as I could get. I remember running outside into my garden where I grow 20 different varieties of scented roses, smelling strip in hand, and alternately inhaling the roses and the smelling strip. It’s a good job I don’t have any neighbours close by because I must have looked like a complete lunatic. I’ve often wondered if I would ever create another rose centric perfume again and I think I probably would because I learned to love this tricky material after my initial baptism of fire. If you’re interested, you can check out my reviews for Anubis, Tobacco Rose, and Angelique. The fragrances cost $160, €120, or £94. In the U.K, you can buy them directly from Liz Moores’ Papillon website, along with individual samples or a sample trio set. The fragrances are also sold at Les Senteurs. In the U.S., Indigo Perfumery and Luckyscent carry the line and sell samples. Indigo offers a sample set option, while Luckyscent ships worldwide. In Canada, the line is available at The Perfume Shoppe. In the Netherlands, Annindriya Lounge and ParfuMaria both carry the line. In Spain, La Basilica Galeria in Barcelona has Papillon, but they don’t seem to have an e-store for online purchase. In Italy, you can find the fragrances at Profumeria Essence. There are no French, German or other European retailers at the moment but, later on, you can check Papillon’s Stockist listing page. 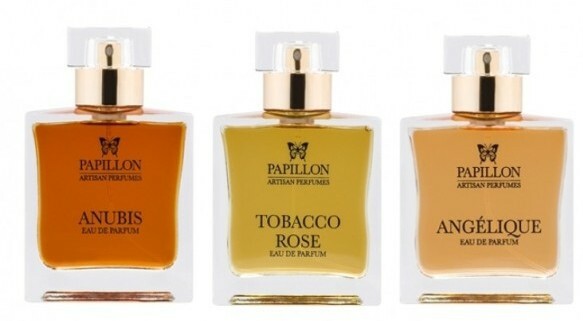 For now, if you want to try Papillon and are in Europe, ParfuMaria has a Sample Program and ships throughout Europe: any fragrance in a 2ml vial is €4 each, or you can get 5 samples for €15. This entry was posted in Papillon Perfumery, Perfume Profiles or Interviews and tagged Anubis, EU Perfume Regulations, EU perfume restrictions, Fragrance Mods, How to get started in fragrances, how to learn about fragrances, how to make perfumes, IFRA/EU compliance, Liz Moores, Liz Moores Papillon, Papillon Perfumery, perfume Mods, Perfumer interviews, The perfume creation process, The perfume process, Working with aromachemicals by Kafkaesque. Bookmark the permalink. Great interview, Kafka. Looking forward to part 2 ! Very interesting to read how Liz creates her fragrances. That was a fascinating, fascinating read, Kafka. Ms Moores sounds like a wonderful lady. Your reviews of her fragrances put them very high on my to-try list (yes, even Tobacco Rose. It sounds so interesting! ), but this seals the deal. I’m so glad, Anne. As for Ms. Moores, she really is a wonderful lady. One of the (many) things that I find so wonderful about her is her complete lack of pretentious, her enormous modesty, and her candour. If she finds chemistry to be challenging and something that she will always struggle with, she says so. Flat-out and honestly. If her math is “rubbish,” if the Mod process is the most arduous for her because she fine-tunes the details repeatedly, or if a fragrance felt like a “nemesis” whose development pushed her to the brink (Tobacco Rose) — then, she says of all that, too. There are no attempts to claim this is an easy process, that she’s a perfume wiz who whips out something perfect in a mere afternoon, or that her perfume knowledge was something she picked up easily or in an instant. She works at everything, shows how it takes time, and presents her work merely as a labour of personal love. She also freely and continuously gives credit to others, from her partner Simon to her children, her friends, and her supporters. You will see more of that in Part II. Plus, for me personally, what matters perhaps above all else that she does is the fact that Ms. Moores is a huge animal lover and animal rescuer. From injured birds and owls, to abused horses, to her vast menagerie at home (snakes! Bengal kittens! Cats called “Jicky”! So much more! 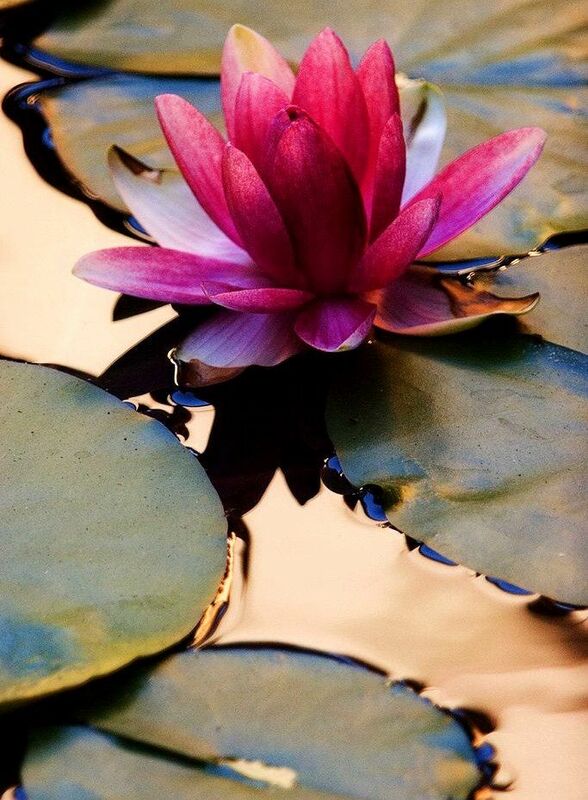 ), she has a gentleness of spirit and a compassionate heart that flows generously to the smallest creatures. Her perfumes are wonderful, but I think that she herself is special on a much more meaningful, important level. You know, one thing I found striking in this interview (among other things) is how much her hard work showed. I deeply respect her determination, dedication and strenuous labour. I appreciate that she took the time to break down the steps and explain them carefully. I was engrossed by the process. She sounds very driven and decisive, with a vision entirely her own. I love that! And yes, I noticed how she mentioned again and again the help of her loved ones. It was lovely. I’m glad to hear about her passion about animals. You know, I wondered about that when I read the bit about the way she took obviousy great care of her horses. It was quite telling. I’m really happy that you found the process and the details engrossing. I did, too. I was truly riveted and had my mouth open when I first read the answers, because I’ve never come across anyone who swept aside the curtain in to show how a perfumer really works, their methodology, and what really happens in the creation process. Another perfumer once told me that the famous, well-known noses intentionally don’t talk about the specifics because they want to keep a veil of mystery over the details. But the perfumer who spoke to me didn’t believe in shrouding what goes on to maintain illusions of some sort of magic, and neither does Liz Moores very clearly. Ms. Moores told me that she omitted details about the filtering process and the standardising of materials (which I would have loved hearing about) only because she was trying to be concise and because she (very thoughtfully) didn’t want to overwhelm anyone with too much information. Still, what she did share is really revelatory, imo. And I’m so glad you appreciated her meticulous explanations. Stupendous interview!! Thank you, Kafka, for asking great questions, and thank you, Liz, for giving such in-depth answers! Yay! I’m so happy to hear all the positive responses, but also that you feel personally inspired. Wow. You really struck gold with this interview. I have to admit to having a mild internet girl-crush on Liz Moores to begin with, so I’m not particularly surprised at her candor as she seems to be a very down to earth and open person. 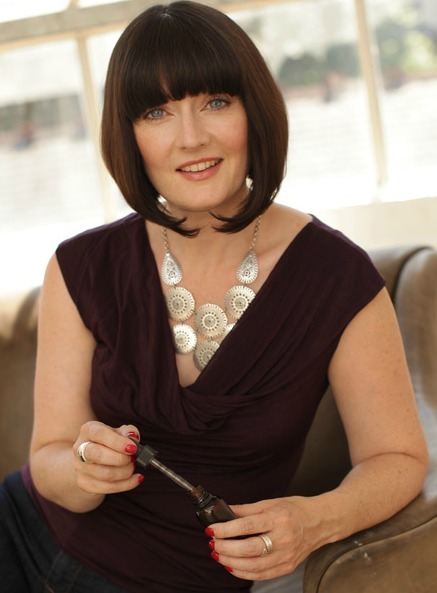 I’m so glad to hear one of my favorite perfumers give real, honest, and practical information about perfumery. There is no reason it should be a big snobby secret and that’s one thing that has always bothered me about traditional perfumery. Not everyone has the talent and drive to create good perfumes anyway so why be so darned close-mouthed about the process? Again, a big thank you to you, Kafka, and to Ms. Moores! Now all I have to do is figure out a way to go and live in her menagerie 😉 I mean, can you imagine? Beautifully perfumed critters everywhere. I’m pretty sure my cat would object to even a temporary adoption of an owl. I agree, it can still be a “sacred art” (or even “Art” with a capital “A”) without all the mystery about the specific details. It’s not as if they’ve found the alchemical secret to turn lead into gold, after all. Terrific questions, fascinating answers! The story behind the creation of Anubis makes my bottle even more special to me. And what a great name for a perfume–White Moth! I love her! She’s beautifully candid and will likely give inspiration to many out there who want to start making their own perfumes. She has proved it can be done, obviously with much dedication, patience, strong will and creativity as well. I do find the requirements to have a chemistry degree from the major perfume schools / companies to likely produce graduates that lack the artistry that can create something gorgeous. Although they undoubtedly will be great at producing something to a strict brief and budget. I know that’s conjecture but one can’t help but wonder. I loved that she uses 50/50 naturals vs synthetics as well. Good to know. Great interview Kafka! I agree, her candour is incredibly refreshing, as is her willingness to shed light on what the big perfumers want to keep a mystery. In terms of the requirement to have a perfume school degree and artistry, I think it depends not only on the path that the graduates take, but also what paths are available to most of them in the first place. 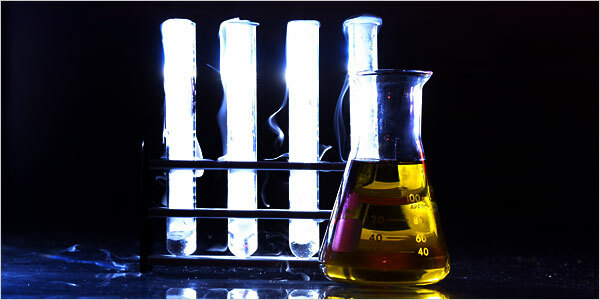 Most jobs are with the big aromachemical giants like Givaudan, IFF, Firmenich, and the like. There is job safety in becoming one of their stable. There isn’t such safety or stability in going it alone, especially after the expense of paying for that education. However, even if one does get such a job, the vast majority of perfume school graduates don’t work on what is theoretically deemed as “fine fragrances.” Despite the adjective “fine,” even something as generic or as cheap as a celebrity fragrance falls into that category. The reason is because the focus is on actual fragrance worn by people, instead of what fragrance for soaps, laundry items, air fresheners, bath products, pet products or the like. That is what the majority of those with a perfume or chemistry degree work on. Out of the very few graduates who do work on actual perfumes, even fewer rise to the top, let alone work on big-name scents. Those who do are — as you yourself noted — usually bound by the perfume “brief” imposed by the client. So, imo, one can’t make any connection between the requirement of having a perfume school degree and “lack of artistry.” It’s the industry and the way it operates that are responsible. I don’t think a lot of perfume school graduates have a lot of choices unless they go it alone, which may not be financially feasible for the majority of them. Yikes! What an amazing, sensitive, and thoughtful interview. I’m trying very hard to describe the feeling I have of a process that has heretofore been dismally unavailable for me to understand, that now has had a very human face put on each and every step in the process. I’m sure she will be incredibly touched by your comment, Robert. Perhaps you should order some aromachemical samples, too, in order to see if that helps you to understand the nuances of the fragrances you own, love, and wear? I think my “Christmas Gift Guide” has some links to a few Perfumer’s Apprentice sets that you may want to consider. Smelling even the more natural essences in isolation may help hone your nose,. I vaguely remember one decent-sized Perfumer’s Apprentice set being very affordable at around $30, and it included a few aromachemicals, I think. Anyway, getting back on topic, I’m very surprised you haven’t tried any of the Papillon scents before. Aren’t you a big floral lover? I don’t know how you feel about iris, mimosa, or champaca in a woody floral blend, but I have the vague recollection of you loving roses. So I would have thought that you’d have tried Tobacco Rose by now, but perhaps I’m confusing your rose tastes with that of another reader. Nope, you remember correctly, big ol’ rose ho’! here! I ordered samples yesterday from Indigo. Will probably end up with full bottles, god knows! Now after reading the interview, they can’t get here fast enough! Can’t wait for part two. Many Thanks! Many thanks, dear Franz !!! Brilliant!Absolutely! I loved reading this.Thank you to both of you. Thank you so much for this interview, you asked very interesting questions! For perfumistas the story reads like a thriller with a fulminant finale! “I stubbornly refused to let go of my vision” – very impressive, inherently stubborn people can be adorable, now I want to smell Anubis so badly and hope they’ll ship to Germany soon!!! It must be fun to smell jasmine and be able to tell wheter it’s from France, Egypt or India. And I often read in interviews that to discover aromachemicals was something like a breakthrough for (self-taught) perfumers. (Btw, today Andy Tauer wrote on his blog that he considers creating a calone centered fragrance…have you read the post, yet? Haha!). No, I haven’t read the Tauer posting, but I should clearly stay away from his next fragrance if calone is to be the centerpiece. I’m still recuperating from his handling of gardenia — a note I actually love — so dealing with a fragrance involving a note I dislike immensely…. no thank you. Fascinating! I’m looking forward to Part 2. Awww, that’s lovely. I’m sure Ms. Moores will be incredibly touched by that! Really fascinating stuff, and Ms Moores sounds like a true artist. Kudos to both of you. Thank you, sweetie. I’m really happy at everyone’s response thus far, because I do think she basically performed the scented equivalent of a Public Service Announcement to the perfumista world about how things actually work for an independent perfumer. Lord knows, the breakdown of her Mods process had my jaw on the ground. So many steps, so much work, so many see-sawing parts involved. Wow. Loved the article, Kafka! And Liz was very generous with her openness which I really appreciated :). She was enormously generous with her time and wonderfully candid. I’m so glad you enjoyed the interview. See, this is why I know I’d best focus on being a painter and not attempt to make perfume! This interview really expresses how committed a serious perfumer has to be. I’m one among many who loves the idea of creating perfume, but the reality is clearly a labour of love indeed. Liz’s process here reminds me strongly of my process of painting – there’s so much to learn, so many set backs and frustrations and you need utter determination to realise your idea and vision. You have to love what you do. Then there’s the battle of getting your creation out there, and selling it! It’s also interesting to hear about the occasional ‘closed doors’ of the perfume industry, and again it shows how determined you have to be to take up perfumery seriously. 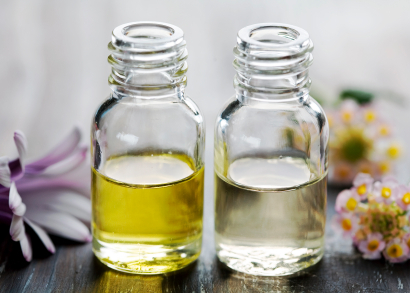 I’ve explored quite a few naturals myself in absolute and essential oils, and I can absolutely see how they can end up as ‘muddy sludge’, and that without enhancement through aroma chemicals they just won’t ‘sing’ as perfumes. In fact it’s one of the things I’ve noticed about a lot of niche perfumes which can be disappointing. I haven’t yet tried Papillon perfumes, but I definitelywill now. Well done Kafkaesque on an informative and fascinating interview! I’m very glad you enjoyed the interview. 🙂 And you’re absolutely right, there is so much hard work involved in the details, details that few of us probably think about often. Creating comes with so many limitations, but even once that is done, then there is a whole other uphill battle in terms of getting something out and selling it. A “labour of love,” indeed. I love this interview. You ask all the questions I am interested in! Anubis is great and Tobacco Rose achieves the tobacco on me, although it’s very rosy. She’s a star. Thank you for this! You’re very welcome, Danica. 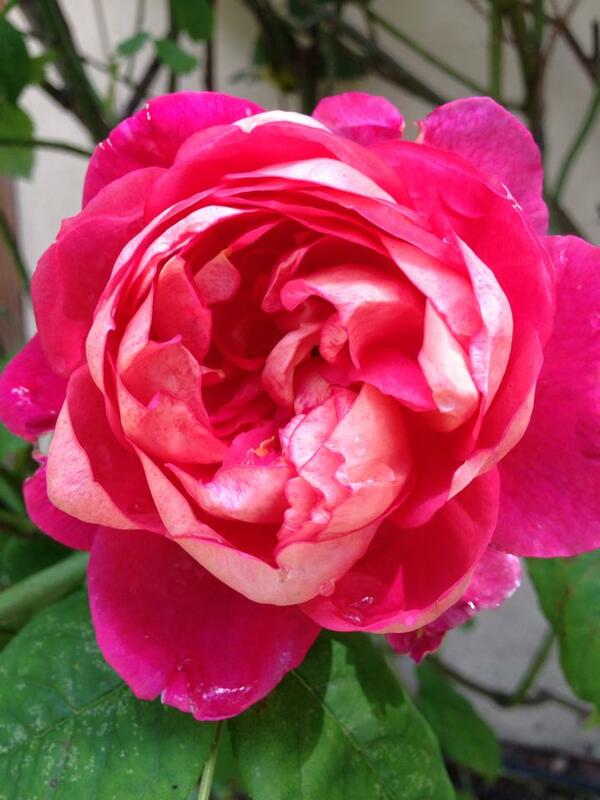 How wonderful to hear that Tobacco Rose shows a dark side on you. I bet it smells lovely on you. Found a german site with samples as well….